Every media file be it a picture or a video file carries an extension at the end of its name. This extension lets us know what type of file it is. For example, for pictures, you may find.JPG, JPEG, PNG, etc., similarly for video files you may find MP4, AVI, etc., as file extensions. You may get the error Invalid value for registry when opening videos or photos on Windows operating systems, be it Windows 7/8/8.1/10. Let us look into it! What is this error? Why this error occurs? How to fix it? What is this error: Invalid Value for Registry when Opening Video & Image Files? This is a commonly seen error alert on Windows platforms noticeably occurred when users try to upgrade their older versions of Windows to newer or latest versions. Later when they wanted to view videos and try to open it that’s when they are greeted with this problem. Sometimes when users try to download media from their handheld devices like Android, iPad, iPhone, tablet etc., it may come up. 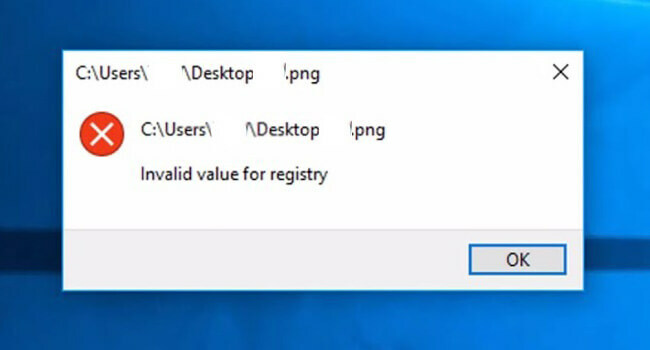 So, basically invalid value for registry when opening video & image files is a registry error which does not allow your application to read and open the related files. You might wonder “What! How does that bring up an error? Upgrading to newer versions is good. Is it not?” Yes, of course, it is good to upgrade your operating system on a regular basis. You’ll not want to miss any of the important updates which make your computer safe and secure. But what we need to understand here is that sometimes not all the applications get updated like for instance your media player app, photo viewer app, etc., or maybe your default settings have got changed. Any of these small things can raise the Invalid value for registry when opening videos or pictures error on your system. 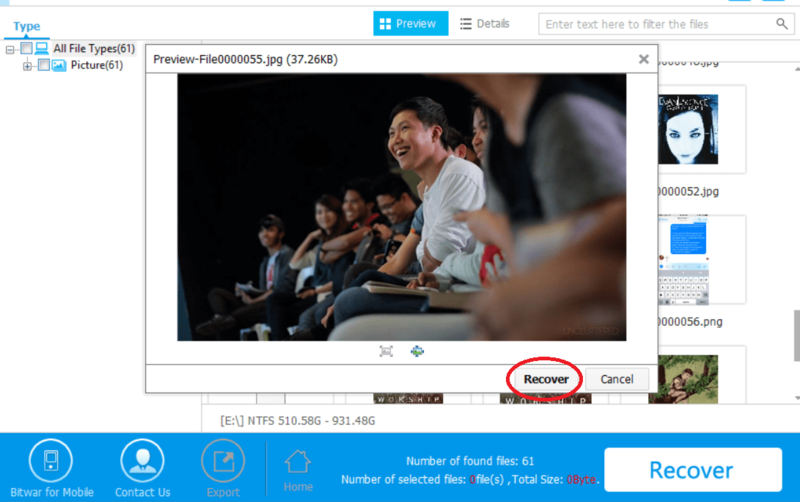 When you can’t open a JPG, PNG, PDF, MP4, MP3, M4A, AVI or any other video, music, image file types with an invalid value for registry error, the issue may most probably lead to unwanted file corruption or deletion. Thus, before doing anything in terms of fixing the error, you should retrieve the files first. Bitwar Data Recovery is a proper data recovery tool that can get back lost video files or other media like photos, audios, and documents, etc. It works with every version of Windows like 10/8 and even on Mac. Download and install Bitwar Data Recovery program and launch it. Choose the drive where the videos are located and tap Next. Select a suitable recovery mode and select the types of files. Tap Scan to get the process started. Tap the file to get a preview. After confirming the files, select the Recover key to get back. All your videos & images will be recovered now! Step 1: Sign in to your computer as Admin. Now, hit Win+R to get the Run window box. Step 2: Type in “Regedit” and hit “OK” to get the Registry Editor. Step 3: Go to this registry:HKEY_CURRENT_USER\Software\Classes\Local Settings\Software\Microsoft\Windows\CurrentVersion\AppModel\Repository\Families\Microsoft.Windows.Photos_8wekyb3d8bbwe. Step 4: You will usually find around 8 entries in total. Remove the outdated entries now. Keep in mind; it is not so easy to delete entries. Step 2: Hit “Advanced” now. Step 3: Tap “Change”, then type the username and then hit “Check Names”. Finally, tap OK. Step 4: Select the option “Replace owner on subcontainers and objects”, and Apply the settings. Next tap OK. Step 5: Navigate to the recently added account and tap “Full Control”. Now, select all the outdated keys, remove them by hitting the right click. 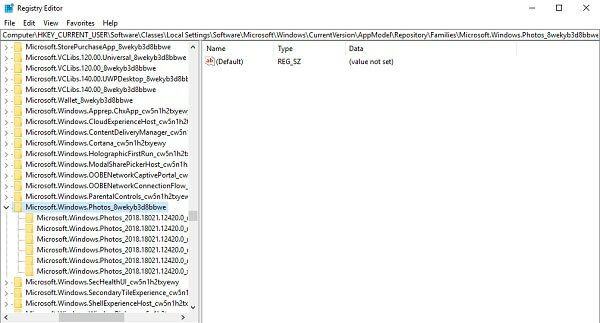 When it is done, close Registry Editor Window and try restarting the computer. This may solve the problem for good! First, find the video file which shows the error. You will be shown “Opens with” option. Now tap “Change”. Again hit OK and navigate to “Properties”. Windows will ask you if you want to open these types of files again with Windows Media Player, tap OK. These steps will definitely help you to fix the issue invalid value registry when opening videos. Using the above steps it is very easy to fix the Invalid value for registry when opening video & image files error in your Windows system. Also, follow the steps in this tutorial carefully as serious problems might occur if you modify the registry key without knowing what you are doing. If you have to fix it by yourself then always make a backup of your registry first before you make any potential changes to it. You should go for Bitwar Data Recovery Software if you want to restore your video files or any image files before corruption. Keep in mind, the content in this article is purely for educational purposes only and not advisable to play with other computers any damage caused may be irreparable. Next articleWhat to do When SD Card Not Full but Says Full? Check This out!